The City of Orlando is taking steps forward in their commitment to make their community green and smart. Motivated by the prospect of adding recycling to their public space waste infrastructure, the City has deployed the Bigbelly system in their downtown area to capture recycables while pedestrians are on-the-go. Mayor Buddy Dyer is on a mission to transform the City into one of the most environmentally-friendly communities in the nation with the Green Works Orlando initiative. By adding Bigbelly to their public spaces, they will be able to recycle in addition to benefitting from operational and environmental savings. Orlando joins many other communities in Florida who use the Bigbelly system to modernize their waste management, implement a measurable recycling program, and clean up their sunshine-filled public spaces for community enjoyment. Some of their neighboring deployments in the Sunshine State include: Lynx Public Transit System, West Palm Beach, Cocoa Beach, University of Florida, Jupiter, Deerfield Beach, Gainsville, Kissimee, Miami Beach, Delray Beach, Lakeland, Osceola, Manatee County, Clearwater, Surfisa, Pinellas Park, and many others. Recycling has come to Downtown Orlando! As part of Mayor Dyer’s Green Works Initiative, we are rolling out new recycling containers to give residents, visitors, and employees of Downtown the opportunity to recycle while they enjoy the great things to do in the area. This program will accompany the recycling containers recently installed around Lake Eola by Keep Orlando Beautiful. 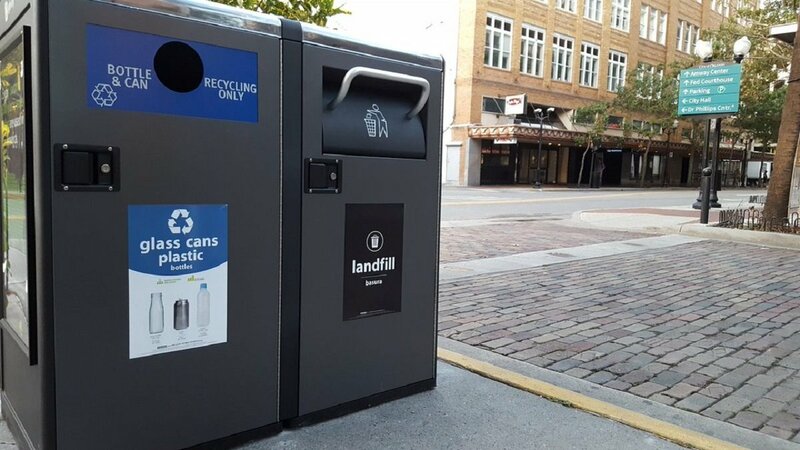 Downtown recycling will begin with [Bigbelly] solar-powered compacting garbage cans that have volumetric sensors, allowing the city team to see the fill level of the garbage and recycling containers in real time. This information will provide insight into the waste stream of downtown, and allow the city to optimize collection efficiency. [...] The labels on our new containers come from Recycle Across America, and bring Orlando into the nationwide movement of standardizing recycling labels to help users better understand what to put in the bin. Recycling is top of mind for the City of Orlando, especially as being recently selected for the pilot location for a new U.S. Chamber of Commerce Foundation program. The program - Beyond 34: Recycling and Recovery for A New Economy - aims to break through the current 34% recycling rate in the United States. We're happy to be a component of this pilot program to create a scalable model for improving recycling and recovery rates in order to help communities around the nation create a more sustainable future. “We’re making significant strides toward that commitment by providing our residents and businesses with the tools and strategies necessary to divert more waste from our landfills, including offering weekly recycling collection, quarterly e-waste drives, free backyard composters to residents, and a commercial food waste collection program that is diverting millions of pounds of organic waste per year,” said Orlando Mayor Buddy Dyer. “In an area such as Orlando with a lot of tourism, it’s important that visitors see the labels and know what can be placed in the recycling can,” said Ian Jurgensen, the city’s sustainability projects manager. Read more from Downtown Orlando, Orlando Rising, News Channel 6, and the City of Orlando press room.